My first pen of Lignum since it was placed on the Cities list. A pen I made some many years ago came from a scrap of a ships bearing that had supported the drive shaft for 40 yrs. It has a reputation of heaviest and hardest of timbers. Depending on where you read, it can be rated the 4th in density where other places show it being 1st. I don't know what standards are used, but I don't really care. 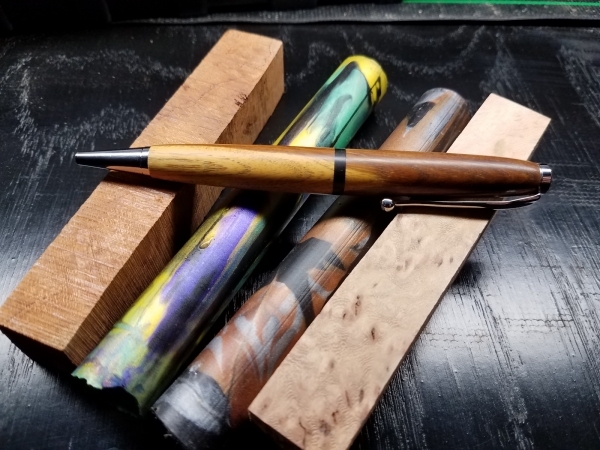 LV is a great wood to use for pens. My grandson made a pen for his father. He picked LV wood. Like drilling tool steel! Pen came out great. That is another great looking pen, Peter. . LV is a nice wood to turn. The LV that I have is kind of a greenish-grey color ... different from yours. I think the greenish grey is the sap wood. I have some of both in my small stash of LV. Here's one I did for a recent trade that has some sap wood in it. The whitish part was greenish grey before it was turned. I'm sure over time it will return to the greenish grey color. This pen also didn't have any finish. Just sanded to 1500. Great looking pens. Do you know the name of the ship the bearings came off of? My father-in-law was a Carpenters Mate during WWII and made a lot of bearings and other turned items from LV. He's shared a lot of stories with me about it. He was stationed on the USS Crosley which was decommissioned after WWII and sold to Argentina, I think, to be used as a power station. I would love to get my hands on some of the bearing and things he made. I have a small piece of LV in my stash, I'll have to try it out. Peter, what finish did you use on your pen. I really like the amount of shine your's has. That design is beautiful. I know you post emphasies Lignum, and it is beautifully finished. I remember a discussion here many years ago that mentioned that mere 10ths of an inch or half an mm difference in location of segment rings or grooves or coves, or a single degree in the change of an angle takes a design from just OK to WOW. Your design is most certainly in the WOW! It really stands out! Thanks for posting! As always, you really have done a beautiful job on the pen. Your skill at adding individualized touches really makes your work stand out.